Close your eyes and I'll kiss you. Remember, I'll always be true. While I'm away, I'll write home every day - sending all my loving to you. You probably recognize those lyrics from the Beatles. Or maybe you're too young? I just got back from Denver late last night and I'm already missing Louisa today and sending her all my loving. I can't believe she's already 10 weeks old! 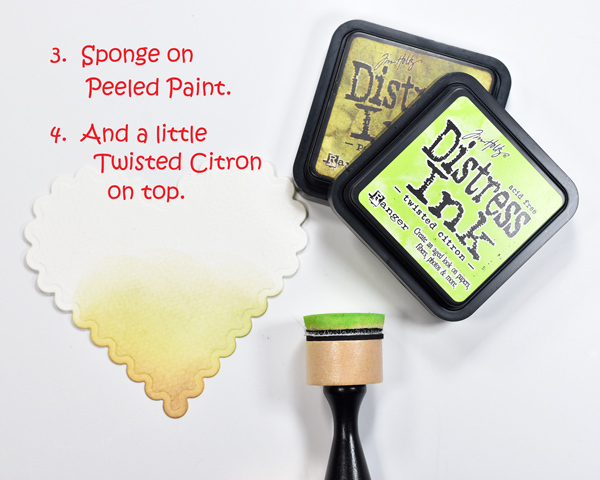 I've got a couple of fun mail related Valentine projects to share today. Isn't this mailman adorable? 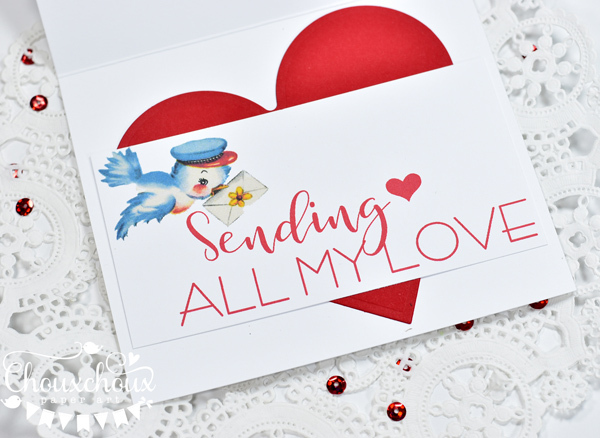 He's perfect for sending a little love to your Valentine! He's all ready for you to download and print below. 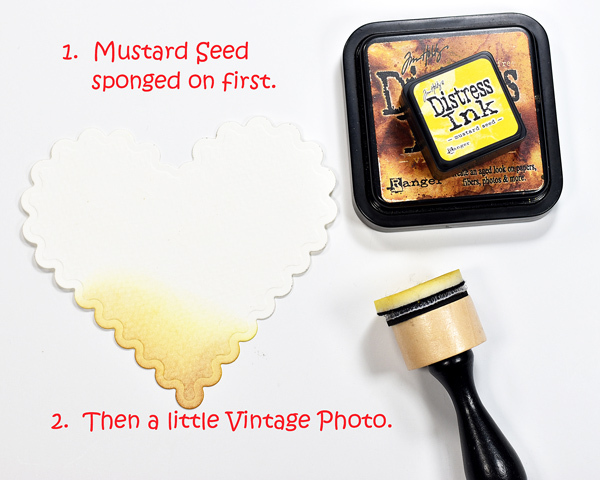 The background heart is sponged with Distress Inks to mimic the original card. My template is a diecut frame. But you could certainly create your own by just cutting some scallops or by using a scallop border die. The heart is die cut from 140lb watercolor paper and sponged on the smooth side. Part of the download is this sweet sentiment with another cute bluebird. The bluebird is on the inside of the original card, which is actually a birthday card for a grandson. But I thought these images were perfect for Valentine's Day. 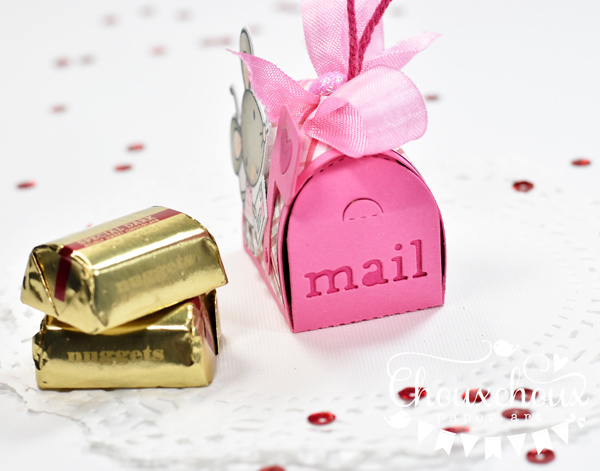 Have you seen these cute mini mailboxes? This one is the perfect size to hold two Hershey Nuggets. So easy to make with the die. Gotta love that sweet mouse, too! Here's an end view. Another great way to send some love! 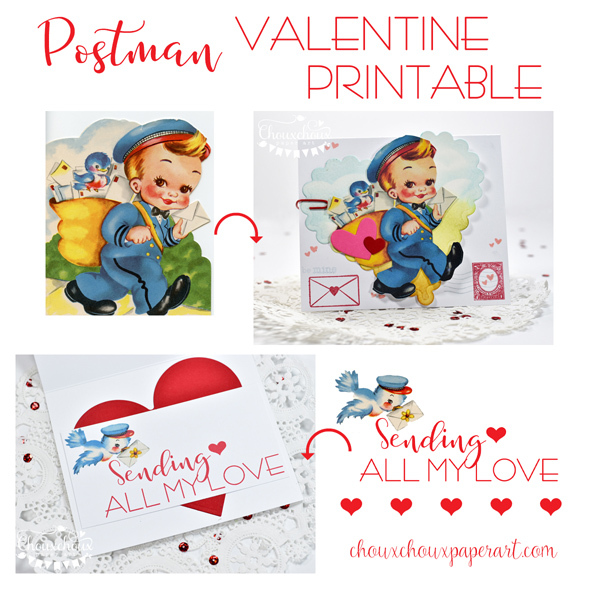 Download the sweet postman and sentiment HERE. So glad you stopped by! Who are you sending your love to this Valentines? Super duper cute, Lori! Love the images you come up with & how you use them! Love that song & can only imagine how hard it is to leave each visit with Louisa--hope you're getting lots of pictures! Hi Lori! 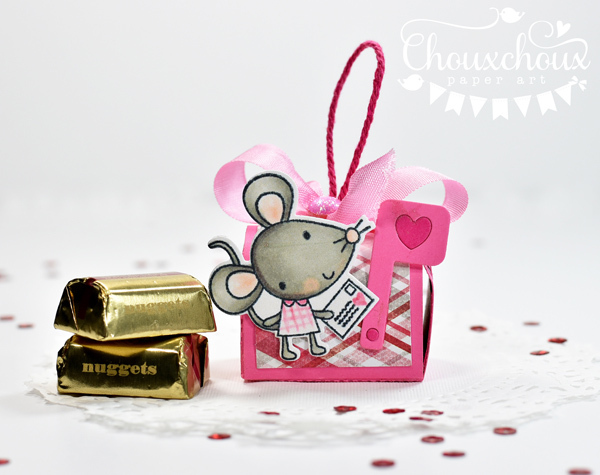 Your card is adorable and so is that sweet little mailbox.. omgosh.. it's sooo CUTE! I remember that song.... Gotta LOVE The Beatles! :) I hope you got lots more pics of that sweet grand baby of yours... I can only imagine how hard it is to be so far away from her... I have a son in the Marines and he's in Japan, so I only get phone calls.... It's hard for sure... :) I did get to talk with him yesterday, so that was nice.... Hoping to see him again this Summer... Every call, or moment you get to spend with the ones you love is precious... Enjoy every moment! Have a great Day! HUGS! That little mailman looks so happy to be delivering his letters and the bird is just precious. Maybe he can deliver your Valentine to Louisa. Wonderful projects! Hugs! So cute and sweet; the mini mailbox is adorable. At ten weeks I bet she's just adorable; b/4 you know it she'll be 6 months and sitting up. Isn't it great, with the technology your daughter can video her and share it. That's how I keep up with my great nephew who turned one last July. It's so much fun watching the videos of him. 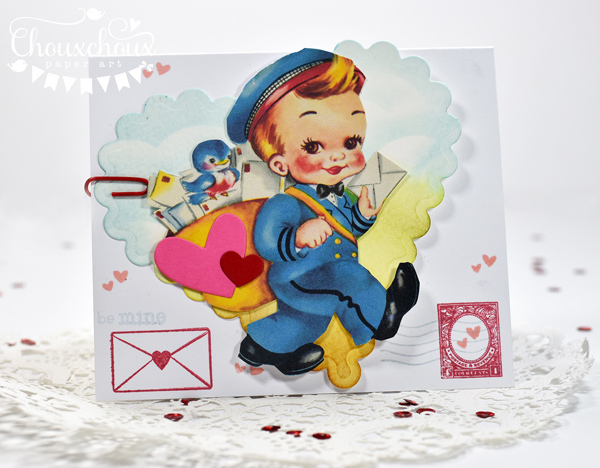 Adorable cute postman and birdie! 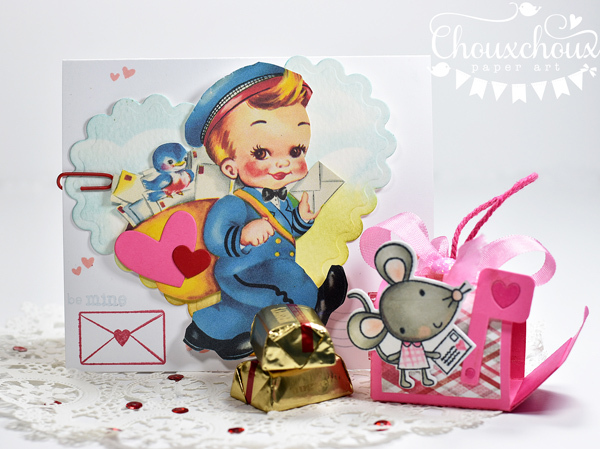 Your card is sosweet and LOVE the pink mailbox just perfect for chocolats!! :D Thanks for sharing these images! Your sweet baby Louisa is delightful...Surely you miss her! Hope you can see her again soon! Valentine's Day doesn't seem that far off as we have already passed the half-way point of January - doesn't time seem to fly. Wonderful Lori - oh how I remember those sweet images from when I was a wee girl! Oh how sweet! This little mailman is adorable! Lori your valentines are so sweet and so cute!!! Your grandson will surely smile with all the love coming from you to him!! :) Thank you as always for the free downloads! O M Garsh these are adorable!! 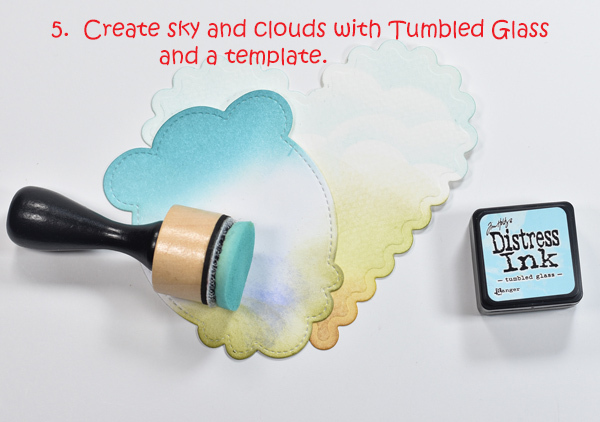 That little postman and how cool to use that tag diecut to make a cloudy sky! Love it... and my oh my that little mouse and mailbox!! Extra adorable! LOVE!! 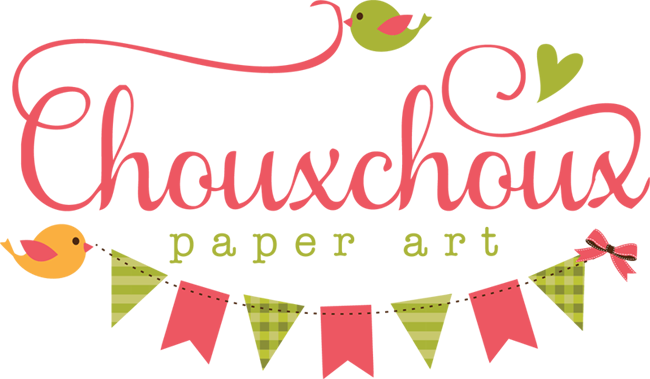 Love your sweet creations, so adorable!! Wonderful vintage images! And, the mailbox with the mouse is just darling!! More cuteness! I love these, Lori! I'm smiling - so adorable! 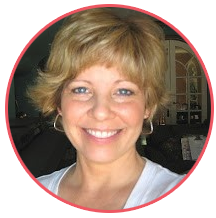 So happy to read you are enjoying Louisa spend lots of time with her! Love the vintage mailman (thank you for the freebie!) and that little mailbox is the cutest! That is a fun die indeed!